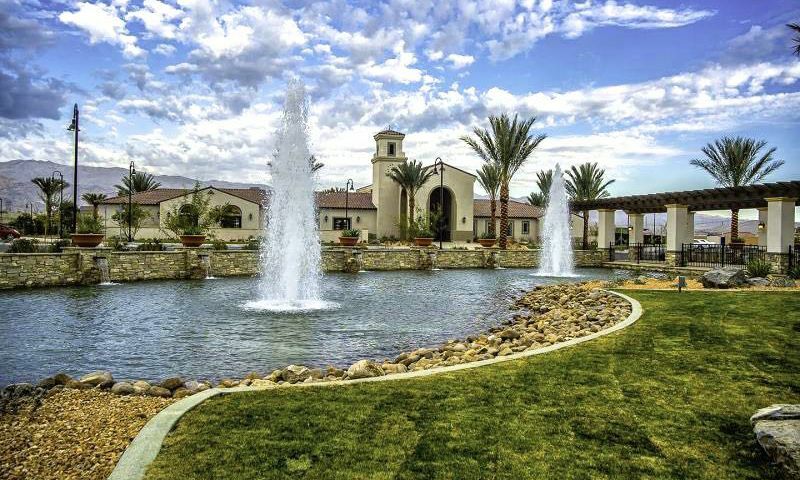 Four Seasons at Terra Lago is an active lifestyle community in Indio, California. This gated, resort-style community will consist of 661 single-family homes upon completion and will feature many of the amenities and functional home styles that K. Hovnanian is known for. Located in the Golf Club at Terra Lago community in the Coachella Valley, Four Seasons at Terra Lago features 14 spacious and open floor plans to choose from, a well-appointed clubhouse, and easy access to the area’s two 18-hole golf courses. Active adults will find that Four Seasons at Terra Lago provides resort-style living in an area with plenty of recreational opportunities. This community features The Lodge, a 22,000 square-foot clubhouse, as its heart. Residents have access to a state-of-the-art fitness center, an indoor lap pool, and aerobics and yoga studio for staying in shape. It also features a meeting room and an arts and crafts studio for attending clubs or finding a new hobby. On more relaxing days, residents can enjoy the beauty salon complete with a massage room or simply grab a book from the library and relax in the lounge. The Lodge also provides several ways of staying active socially with a lounge area, a game room, billiards table, and bistro for catching up with neighbors. Outdoors, The Lodge has a beautiful resort-style pool and spa, a perfect way to cool off after playing at the tennis or pickleball courts. Four Seasons at Terra Lago also provides homeowners with several areas to enjoy the Southern California climate with an outdoor patio, cabanas, and a fire pit on those cool, desert nights. Residents can also join a game at the horseshoe pits, the basketball or bocce ball court. Golfers will also enjoy proximity to two 18-hole golf courses at the Golf Club at Terra Lago. Four Seasons at Terra Lago will have 661 homes once construction is complete. These homes feature two to four bedrooms, two to two-and-a-half bathrooms, and an attached two to three-car garage. They range from a modest 1,559 square-foot model perfect for the downsizing couple to the more luxurious 2,747 square-foot model for homeowners who want more space. These homes come standard with many features that will delight homebuyers, including striking Spanish, Italian and French architecture. These well-appointed homes also include ceramic tiling in the kitchen and bathrooms as well as open floor plans perfect for socializing with neighbors or guests. Residents can also look forward to both new and resale homes outfitted with modern features like recessed LED lighting in the kitchen, energy-efficient appliances, and gourmet kitchen islands. Homeowners at Four Seasons at Terra Lago will have no shortage of activities and clubs to attend. With the beautiful clubhouse, there will be plenty of activities and events taking place in the meeting rooms, arts and crafts studio, and fitness center. Residents can enjoy a yoga or Zumba class or get to know fellow neighbors with casino night or with paint and sip. Next door, golfers will find two 18-hole golf courses at the Golf Club at Terra Lago, a terrific option for golf enthusiasts who want to get in a round while enjoying the scenic Palm Springs landscape. Four Seasons at Terra Lago is located in Indio, California, about 20 miles from Palm Springs and just 30 miles from their international airport. It is part of the larger community of Terra Lago. Residents also enjoy quick access to Interstate 10, making short day trips very convenient. For everyday needs, Four Seasons at Terra Lago is also conveniently located less than three miles from a large shopping center that has a Target, banks, and Home Depot. Indio, being in the Palm Springs area, is a golfer’s paradise, featuring over a hundred golf courses set amongst the beautiful desert landscape. The area is also host to several hiking and biking trails, wineries, and state parks. Locals also enjoy the Coachella Valley History Museum, the La Quinta Museum, or the Children’s Discovery Museum. Four Seasons at Terra Lago’s modern homes are in an exciting area, making it a great option for any prospective homebuyer looking in Indio, California. The Lodge - 22,000 Sq. Ft. There are plenty of activities available in Four Seasons at Terra Lago. Here is a sample of some of the clubs, activities and classes offered here. This exclusive, gated community will consist of 661 single-family homes. Here, you will find the active resort lifestyle that you have been searching for. The homes at Four Seasons at Terra Lago range from 1,559 to 2,747 square feet and feature two to four bedrooms, two or two-and-a-half bathrooms, and an attached two to three-car garage. I love this place because of the people they are the best. Yes, there are many things to do here and I'm a busy gal. The only sad point I'm a swimmer I prefer the outdoor pool. For a pool being only 4 or 5 yrs young sad to say it looks like it's 15 yrs old. Like it needs a whole new face lift. Calcium build up all around the pool sides and bottom dirty it needs a good acid wash along with new tile. My backyard is not large enough for a pool otherwise I'd be putting one in. Hoping one day the outdoor pool will get her deserving face life that is badley needed. I have been looking for an active retirement community for husband and myself. Have looked at a few this place looks like they have it all. People are my main thing the reviews I feel have sealed the deal. Living in AZ. from CA. wanting to move back due to Grand babies. Want to thank those who have written these reviews because it has helped in so many ways. Can't thank you enough and so looking forward to our move. Thanks everyone! While there are many wonderful amenities here at Four Seasons at Terra Lago, let me share some of the things I love the most. First, the people here have been so welcoming since day one. We found a community that is diverse in many ways. You feel that everybody in this community counts and matters. We have been in our new home since early September 2016. The resort style living is probably one of the most attractive benefits. I feel as though we are on vacation every day. We get involved with as much as possible. There are so many fun clubs to join, each of which is led by a resident. There aren't enough hours in the day to do them all. We enjoy socializing over coffee at the Lodge Bistro. The manager, Liz, is quite an asset with her magnanimous personality. My partner an I have joined the Bocce club and play at least four times a week. I have taken a real liking to pickleball and try to play a few times a week. There is game day where you can learn to play Majongg. There is a watercolor class that I absolutely enjoy as I can get my creative juices flowing. I have plans to take up golf and what better place than right here on one of two well played courses. We have many events, and get-togethers, potlucks, parties with live music. But we have to come back to the people. Being in an 55 plus active gated community puts us on par with everyone else. We have a lively group of people who look out for each other. Living in an Association guarantees pride of ownership and so it gives you a feeling of satisfaction and fulfillment living here. I could go on and on about the hiking club, yoga, water aerobics and much more. But suffice to say, our choice to retire here was the best decision we ever made. If you read this, I hope you will stop in and visit. Ask for Liz (resident) and I would be happy to share with you. I have been a resident of Four Seasons at Terra Lago for about 2 1/2 years, being one of the first residents to move into this beautiful community. From the first day I moved in, I have not regretted my choice. After looking at several Active Lifestyle communities nothing came close to the khov homes in my price range. The models are exceptional as are the finished products. The sales office guided me through the purchase process with professionalism but also with warmth. I felt immediately like I was at home. During these 2 1/2 years I have watched the community grow. The residents are as exceptional as the property. There are so many activities and that too is growing. Our lodge (club house) is gorgeous. All in all, it was a great move and I feel so fortunate to have made some lifelong friends. Besutiful communiyy, but beware , no security, only gate entrance guard in front gate! Not a secure gated area, many open areas with no restrictions to enter, no cameras or assistace for crime! Car stolen, never returned! fiund in Thermal burnt, also gas stolen from vehicles! This is not a secure guarded community , with the only HOA is run & controlled by builder!!! Four Seasons at Terra Lago is wonderful welcoming active lifestyle community. My husband and I were looking for a 55 plus community to move into closer to our granddaughters. The first place we looked at was the Four Seasons at Terra Lago and decided there was no reason to look any further. We moved in December 2, 2016 and have not regretted our decision. We have meet many wonderful people at the events we attend. You can stay a busy as you want, just to name a few activities there is water exercise, bocce club, mahjong club, yoga & Pilates classes, hiking club and watercolor classes. The sport court will be opening in early March and offering tennis, pickleball and basketball courts. In your down time you can book an appointment at the hair salon or book a massage therapy without having to drive out of the complex. This is the first ever review I have written on anything so I hope it will show you how much I love living here, my home and my wonderful neighbors. 55places.com is not affiliated with the developer(s) or homeowners association of Four Seasons at Terra Lago. The information you submit is distributed to a 55places.com Partner Agent, who is a licensed real estate agent. The information regarding Four Seasons at Terra Lago has not been verified or approved by the developer or homeowners association. Please verify all information prior to purchasing. 55places.com is not responsible for any errors regarding the information displayed on this website.